I think next to 3-D die cut boxes my favorite CC&M product is window cards, I love the surprise peeking through a window. (This card is known as the 5-1/4" Square Scallop Card Heart Window Vertical.) On this card I printed a daffodil digital stamp on vellum and embossed it speedy quick then colored it with my trusty Bic Mark-it markers (sharpies or copics would work too) then sewed it behind the window opening. It may seem tricky to machine stitch around a heart shape but here is a crafty trick: Start at the bottom point of the heart and sew up to where it starts to curve then instead of using the foot pedal on your machine use the turning wheel on the right hand side of your sewing machine to go one stitch at a time until you get over the "humps" then use the pedal as you stitch down the other strait side. I'm no seamstress but I love the look I get when I stitch on a card. Here is another tip: If you don't have the right color "bling" for your card you can alter clear rhinestones just color them with your solvent based markers such as Bic Mark its, Copics or sharpies. I use a small glue dot to stick the rhinestone down then color right over it with the marker, works like a charm! 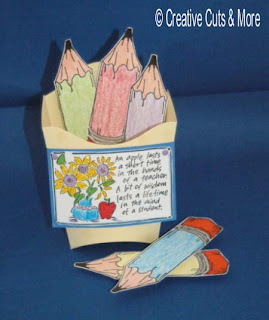 Design Team member Diane Koerner created this adorable teacher's gift. The French Fry Box was cut from Bazzill Criss Cross Buttercream Cardstock. She filled it with magnets and put a strip of magnet inside the box. She colored the pencil magnets with Prismacolor pencils. Markers were used to color the flowers, apple etc. The flowers were decorated with Stickles Glitter Glue in Yellow. Stamp Credits: the pencil and flower are from Stamps by Judith – The saying an apple lasts is by Stampassions. When I saw the little dress box my mind went to Hula Girl , I think I need a vacation!!! I really like how she turned out though. I had the die cut in Almond Creme smooth cardstock to give her a little bit of tan. The skirt was made using a table skirt we had used for a Hawaiian Birthday Party. The lei was made using a small paper punch and punching little circles out of silk flowers then stringing them on a needle and thread. A kaiser rhinestone for a belly button ring and a little bikini top and she's done! Designed by Jennifer Johnson Creative Cuts and More Designer. Thank you, everyone, for participating in our Blog Hop and helping us to debut all those great new dies! Nice work from "The Diva Dozen" this was lots of fun going from one blog to the next. I saw lots of great ideas. I especially loved Pam's Baby Shoes and Diaper Card. So, Debbie H., please contact us with your mailing address and cardstock choices for your very special castle album! Congratulations! Blog Hop = New Dies & Blog Candy! 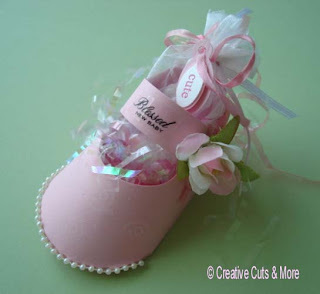 These first two projects use the Baby Shoe die (one in pink smooth and the other in pearlescent swirlette). Created by Kat Salmon, one of our newest design team members. 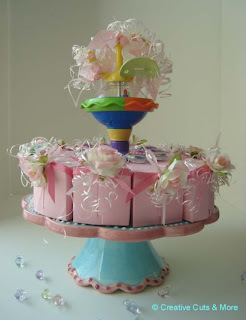 Another gorgeous submission by Kat is this jaw-dropping baby shower cake made with the Cake Slice Box Set. 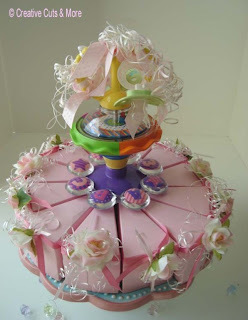 She really dressed up the presentation with the adorable cake plate, curled ribbons, and toys! Next up is a fun recipe book made from the brand new 6"x6" mini album dies. It was created by talented CC&M customer Tricia Marshall. And see these magnificent food die cuts? These will be available soon at Creative Cuts & More! And this adorable ABC Book was created by Kat Salmon using chipboard cut from the 8"x8" Album Set dies. She also used the Straight Frame in Blackberry Swirl Smooth. She did such a gorgeous job! The Hungry Animal is a line of fabric for children -- and she cut out each of the fabric animals and added them to the book. What a labor of love! During the hop, one of our Design Team members will direct you back here for the chance to win one of our new Creative Imaginations Bare Elements castle albums AND 8 pages custom cut for you from your choice of cardstock. Leave a comment on this post with the secret phrase hidden somewhere in the hop. Entries will be accepted through 11:59PM Mountain Time on Thursday, May 14th and the winner will be posted the following day. Our hop today starts with Angie and she'll direct you to the next blog, and they'll direct you to the next blog, and so on. If for some reason a link is broken, don't panic. Just return here to the list and complete your journey. Want some wedding favor ideas or have some wedding creations to share. 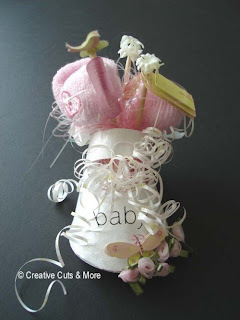 Creative Cuts and More is sponsoring Cuttlebug Challenge this week. So hop on over, check out all of the amazing samples the Cuttlebug Challenge design team has put together and enter the challenge. Happy National Scrapbooking Day everyone!!! We have a great new addition to the Creative Cuts and More design team, Jennifer Johnson. Jennifer is known for her fabulous scrapbook layouts, so we are very excited to have her join the team. Jennifer made this great layout using Creative Cuts and More's 11 1/2" Scalloped Die Cut. Creative Cuts and More carries a wide variety of shapes that make a wonderful addition to any layout.